Ships today if you order in the next 5 hours 21 minutes. 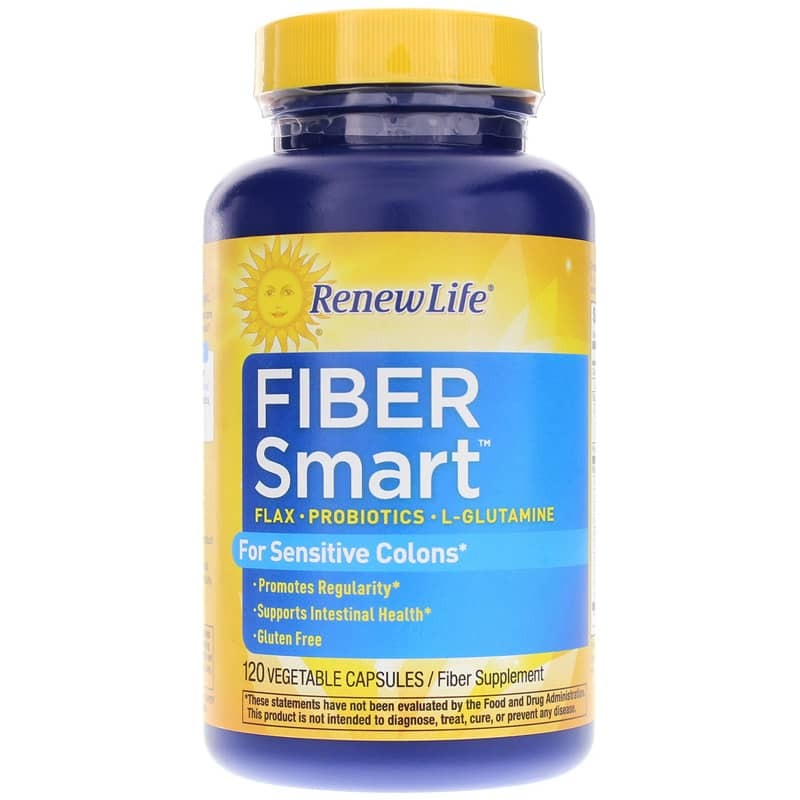 Fiber Smart from ReNew Life is an advanced high-fiber formula designed for sensitive colons that combines organic flax fiber with L-glutamine, probiotics, and soothing herbs to support intestinal health. 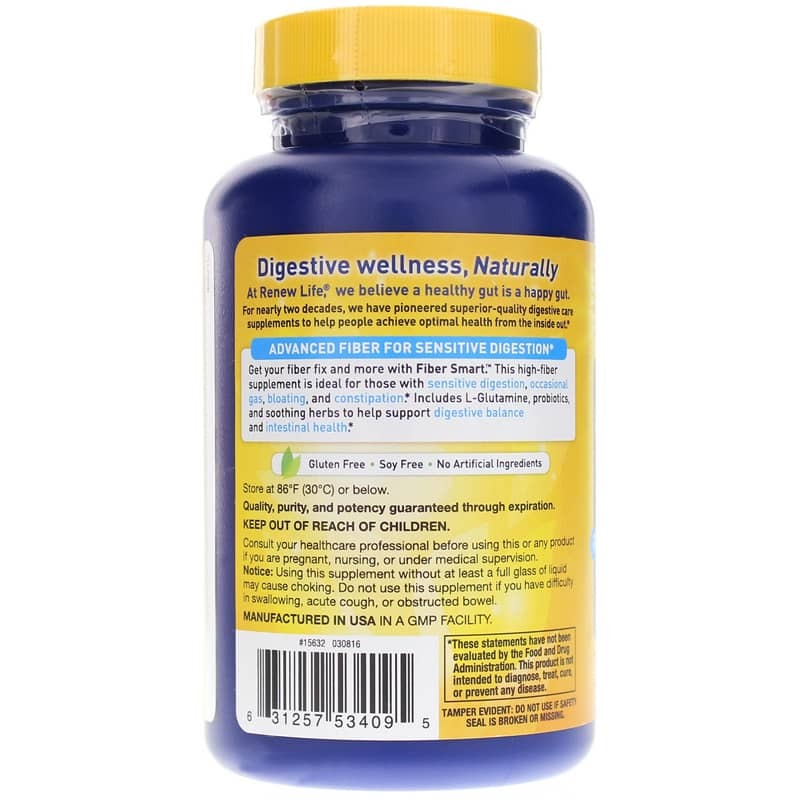 Ideal to promote regularity for those with sensitive colons who deal with occasional gas, bloating, or constipation. Non-cramping, psyllium free, gluten free formula, and is guaranteed for quality, purity, and potency through expiration. Includes organic flax fiber, plus L-glutamine, probiotics, and soothing herbs to help support digestive balance and intestinal health. Other Ingredients: vegetable capsule (vegetable fiber and water). This product may contain mild traces of milk proteins from fermentation ingredients. Contains NO: gluten, soy or artificial ingredients. Adults: Take 4 capsules in the morning with 8 ounces of water. May be repeated at midday and in the evening. Drink plenty of water when using this product. Consult your healthcare practitioner before using this product, especially if you are pregnant, nursing, take medication or have a medical condition. 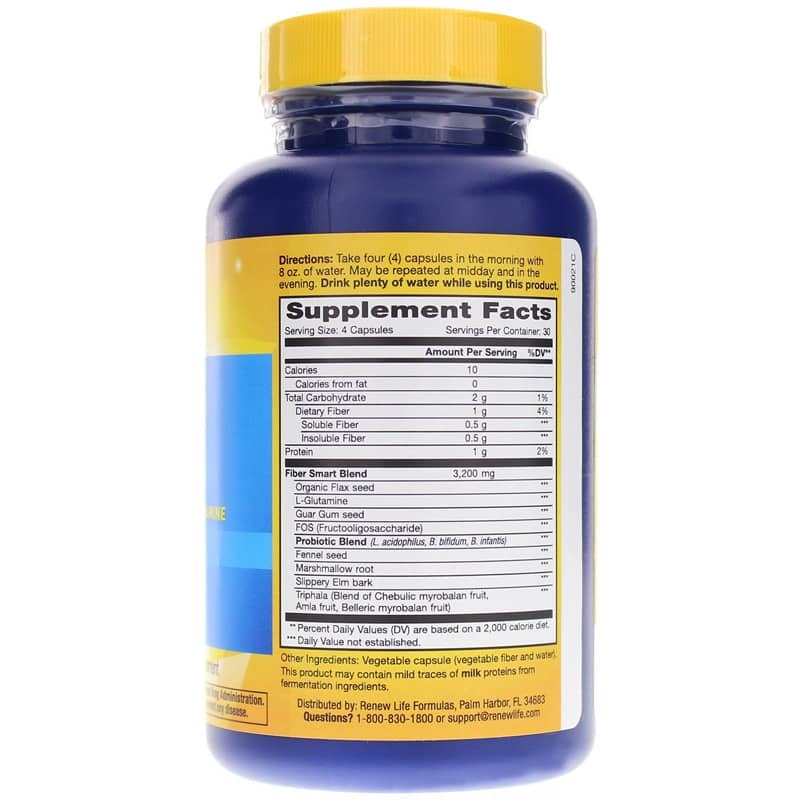 Using this supplement without at least a full glass of liquid may cause choking. Do not use this supplement if you have difficulty in swallowing, acute cough or obstructed bowel. Keep out of the reach of children. Have had no problem with regularity since taking FiberSmart. I like the fact you can take the capsule along with other supplements and a glass of water. No need to mix a powdered product in water and try to drink several glasses. Easy to take with you on vacation. I have been using this product for about 10 years. I would recommend this highly to anyone. It has no side effects but works well.